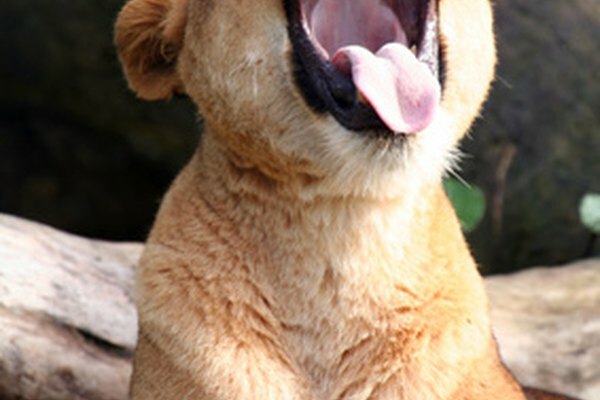 The African lion is a warm-blooded mammal that breathes much the same way we do--through the nostrils, mouth and lungs. 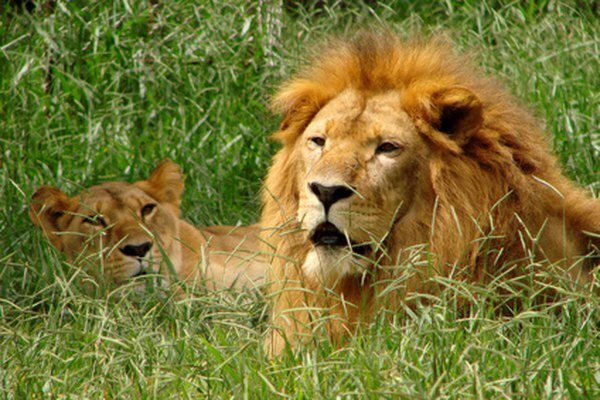 African lions typically live in warm climates, so heat is an issue for them. The African lion thermoregulates by a simple heat exchange across the skin. They often pant after exertion, a large meal or prolonged exposure to direct sunlight. This is why they are nocturnal carnivores, doing most of their hunting at night when it's cooler. During the day, they can be found lounging in shaded areas around trees. They often lick their forelimbs to cool the blood in the highly vascular area. The African lion belongs to the Felidae family and is one of the four big cats in the pantera genus. It is the second-largest living cat next to the tiger. 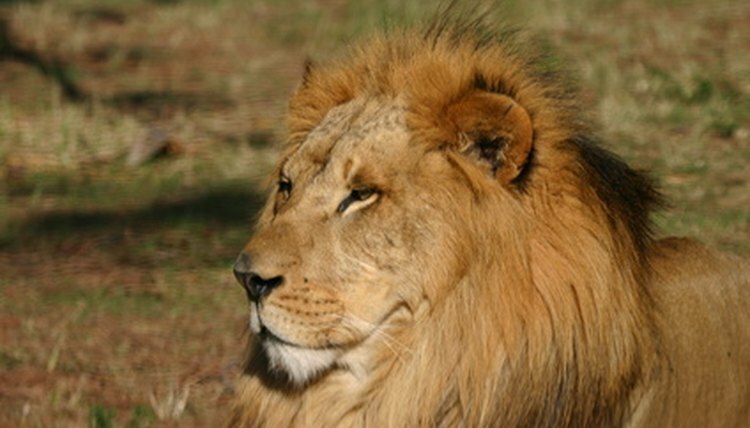 The male African lion has a mane and reaches 330 to 500 pounds and a length of up to 6.5 feet from head to tail. It stands 26.25 to 39.5 inches tall on all fours. Most lions today live in central Africa, where there are an estimated 16,000 to 30,000 of them, down from 100,000 in the early 1990s. They became extinct in Europe, North Africa and the Middle East by the early 20th century. 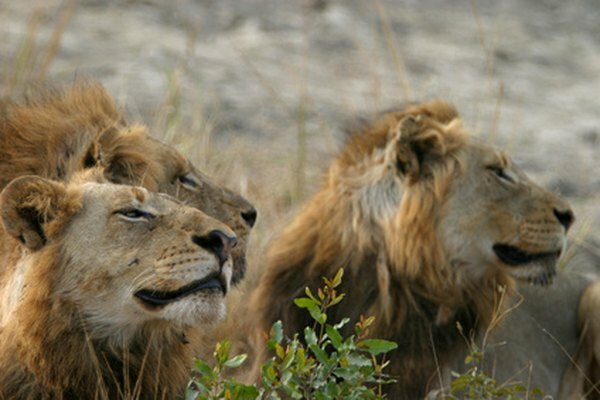 Lions are the only large cats to live in groups called "prides." 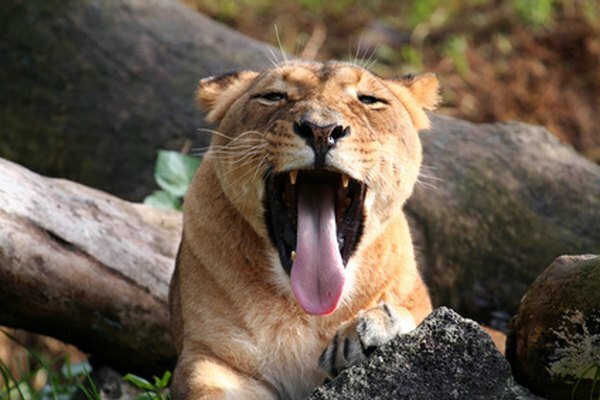 The African lion breathes continually the way we do via a two-way respiratory system. The lion breathes in oxygen and expels carbon dioxide, creating energy for cell growth in the process. Carbon dioxide impacts their pH systems, and the expiration of gases necessitates lots of water. Lions have an upper and lower respiratory tract. The upper respiratory tract is outside the chest (thoracic) cavity, and the lower respiratory tract, which contains gas-exchanging pulmonary tissues, is inside the chest cavity. Respiratory mucosa covers the respiratory tract with a watery saliva that serves to move debris through the tract, thereby keeping it "clean" with the aid of vibrissae, or small nose hairs, that oscillate. As the nose takes in oxygen, cilliated mucus keeps dust, pollen, bacteria and small insects from entering the throat and lungs. The nose is held open by the skull bones and cartilage. It is divided into two quadrants, the right nostril and the left, also called anterior snares, or nostrils. The mucus also serves to warm the air as it enters the body to avoid damage to lung tissue caused by air that is too cold. As the African lion inhales oxygen through its nose and mouth, the thorax expands, increasing the volume of oxygen in the lungs. This is controlled involuntarily by the muscles in the diaphragm. During deep breathing, the muscles between the ribs raise the ribs up and out and expand the thorax and lungs. 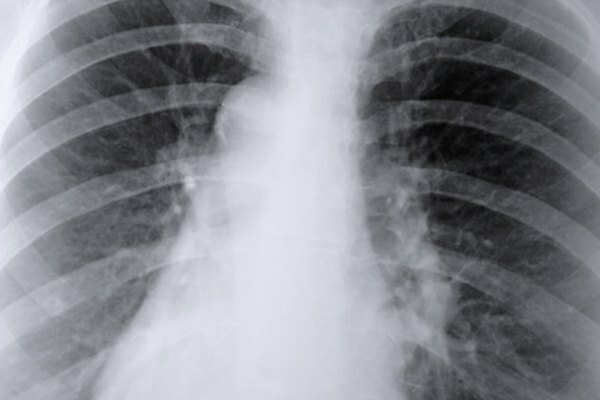 When exhaling, the thorax relaxes, decreasing the lung capacity by the elastic recoiling action of the diaphragm. Muscles pull the ribs downward and inward, reducing the oxygen levels in the thorax and lungs. Gases are dissolved in water and exchanged by diffusion across the thin mucus membranes in the aveolar wall, basement membrane and capillary wall. As oxygen moves into the blood, carbon dioxide moves out. During this process, ventilation occurs, cooling the system and ensuring a steady supply of fresh air to the respiratory tracts. Systematic gas exchange takes place in all other tissues as oxygen is exchanged for carbon dioxide. As oxygen enters the nose and mouth, a small amount of it is dissolved in the plasma. Most of it attaches to the hemoglobin in the blood, specifically the iron-containing heme groups in the Hb molecule. High temperatures, high carbon dioxide content and low pH are catalysts for increased oxygen diffusion. As carbon dioxide is exhaled, around 7 percent dissolves into the plasma. Another 23 percent is carried to amino acid chains. The remaining 70 percent is carried in the plasma and expelled through the nose and mouth. As in humans, the respiratory cycle is regulated by a network of interconnected regulatory centers located in the brainstem.